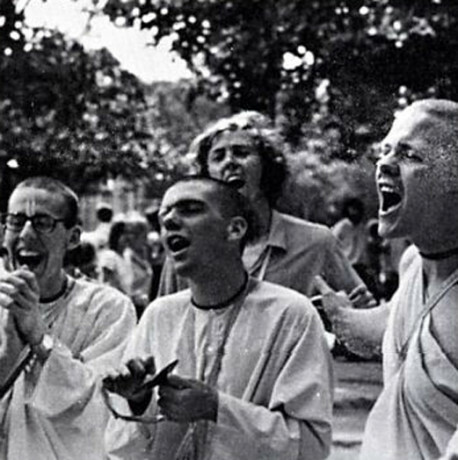 Spiritual life is blissful, but it is not whimsical. 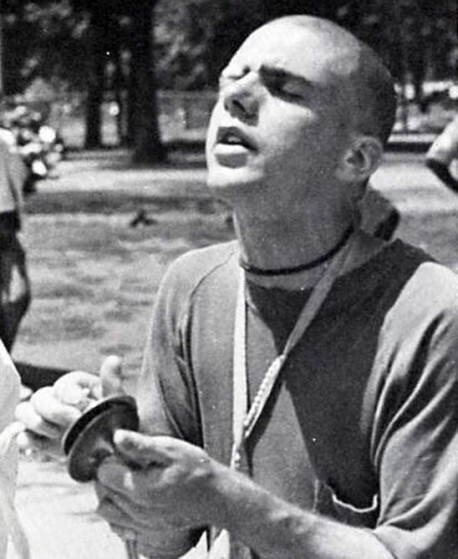 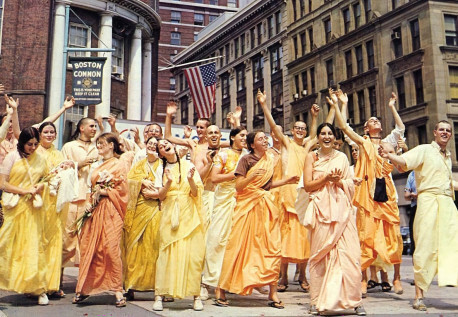 The regulative principles of bhakti-yoga (the yoga of devotional service), as defined by the spiritual master and the authorized scriptures, form the standard way for the conditioned soul to come to the purified stage of spiritual existence, and one must first reach that joyful stage of purification before he can serve Krsna in spontaneous love. 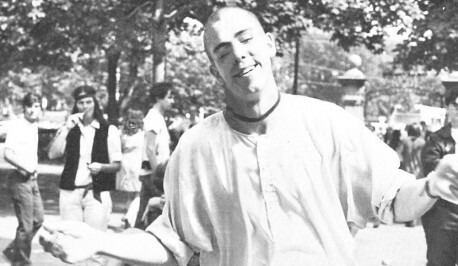 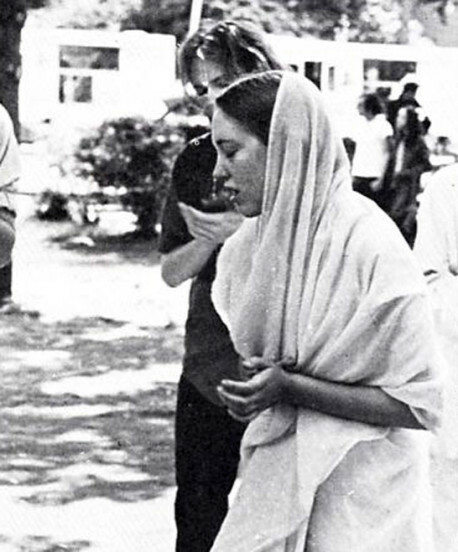 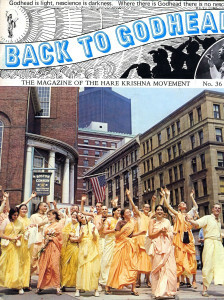 The Krsna consciousness bhakti schedule in Boston is rigidly followed. 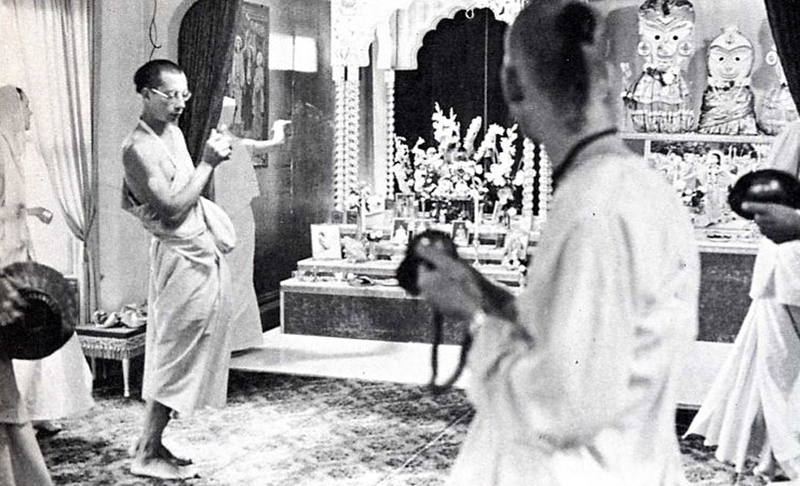 The day is filled with various activities, especially sankirtana (the public chanting of Hare Krsna), the printing of the spiritual master’s literature, and the worship of the Deity in the temple. At 3:30 A.M. the brahmacaris, single celibate students, are awakened by the chanting of Hare Krsna and brought to their feet. Some devotees are awake long before 3:30. 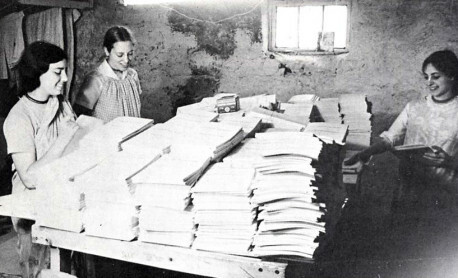 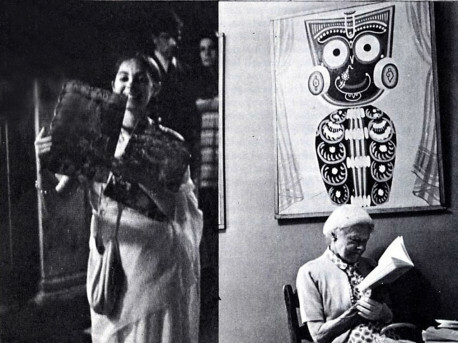 As early as 3:00 A.M., the pujari (caretaker of the Deities) is up doing her duties, and designated press men are working transcendental night shifts on the IBM composing machine which is putting out an unlimited stock of Sanskrit literature. 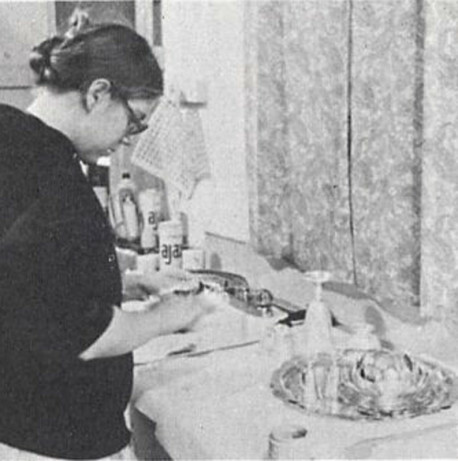 At 3:30 A.M., the cooks begin preparing foodstuffs which will be offered to the Deities in the temple at the 4:30 A.M. ceremony. Also at 4:00, girls start making flower garlands for the Deities. And several days a week the temple vehicle starts out early in the morning to purchase flowers to adorn the Deities. 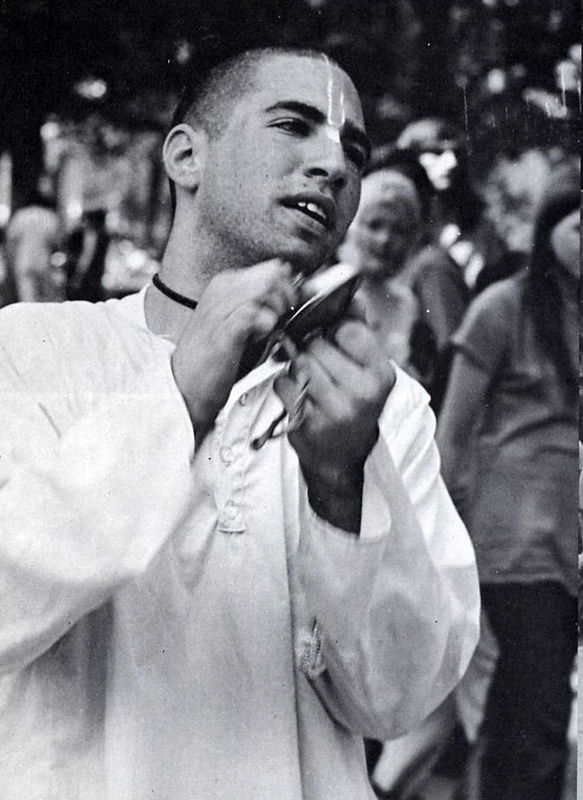 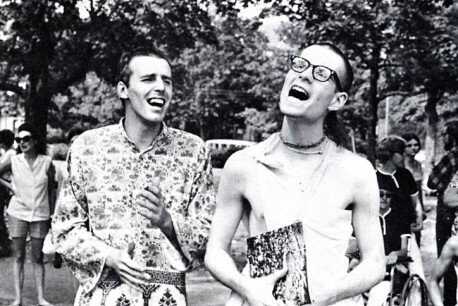 The goal of all these activities is to realize Krsna. 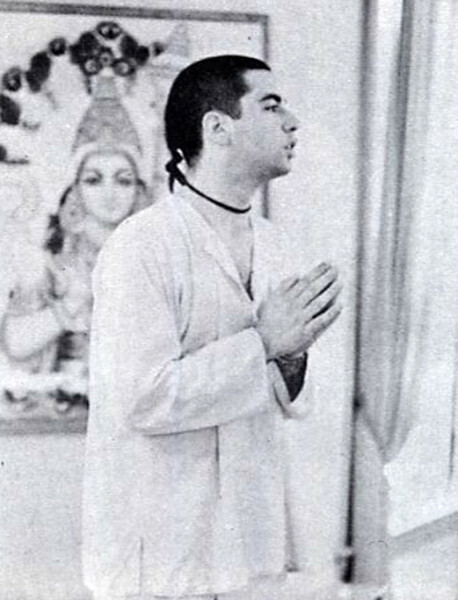 It is stated in the scriptures that if one not only recognizes that God is great but personally engages in His service, then he is the perfect yogi and is most intimately linked with the Supreme. At 4:30 the Supreme 1,ord is glorified in the form of His Deity incarnation. By His mercy the Lord appears in the Deity form of stone or wood, and the devotee is thus able to perform loving service to the Absolute Truth, who so kindly accepts being bathed and being dressed and fed. 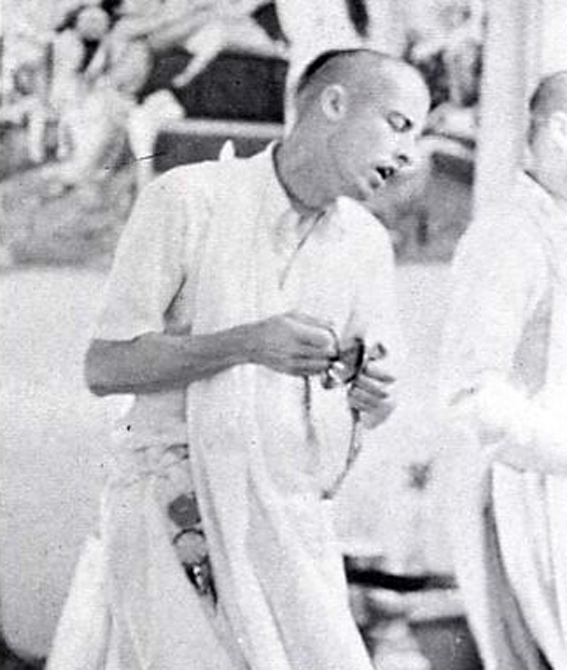 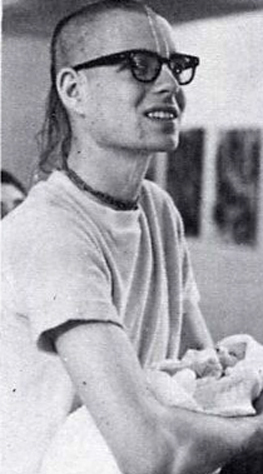 During the morning kirtana ceremony, praises are sung to Krsna and the guru, and especially the mahamantra—Hare Krsna, Hare Krsna, Krsna Krsna, Hare Hare/ Hare Rama, Hare Rama, Rama Rama, Hare Hare—is chanted. 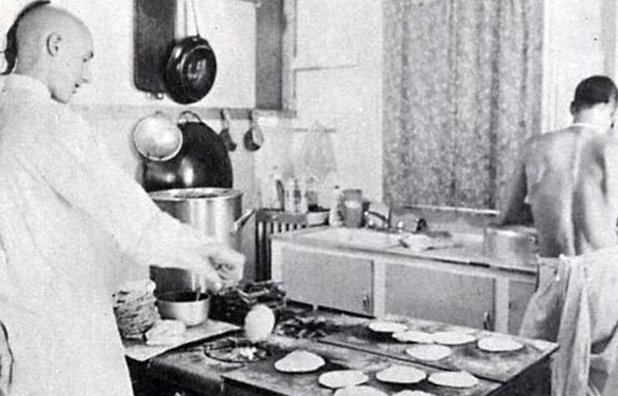 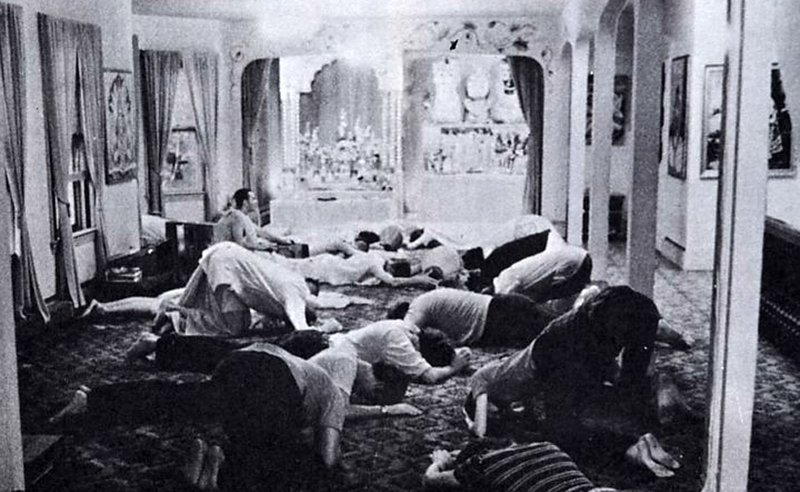 At 7:30 there is breakfast and then cleanup until 9:30, when there is a Bhagavad-gita class. 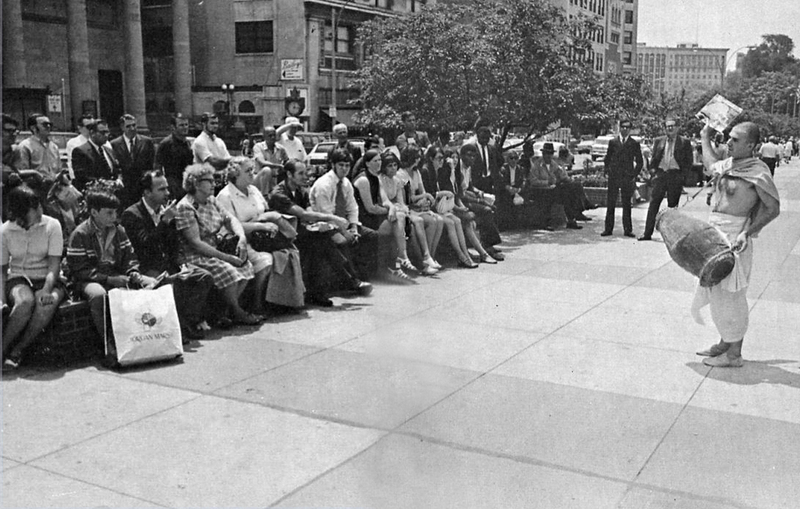 The public is invited to take part in this program, beginning from the seven o’clock service. 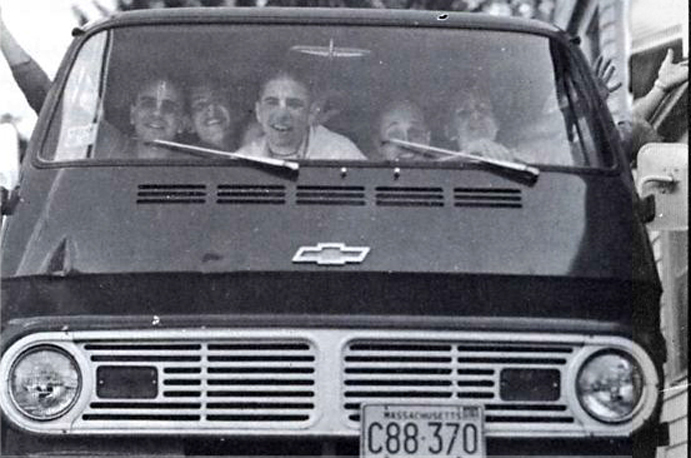 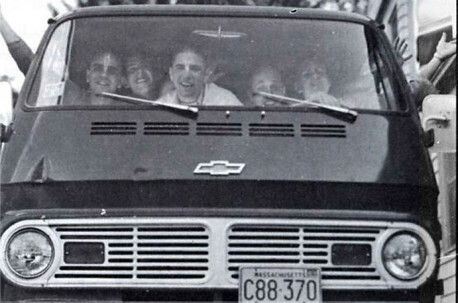 The sankirtana party, with all paraphernalia for a full day of chanting, leaves at 11:00 in the sankirtana van. 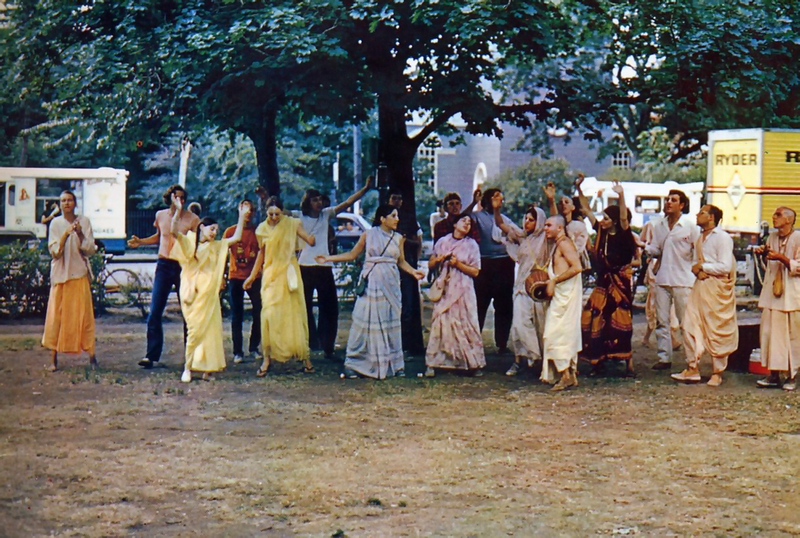 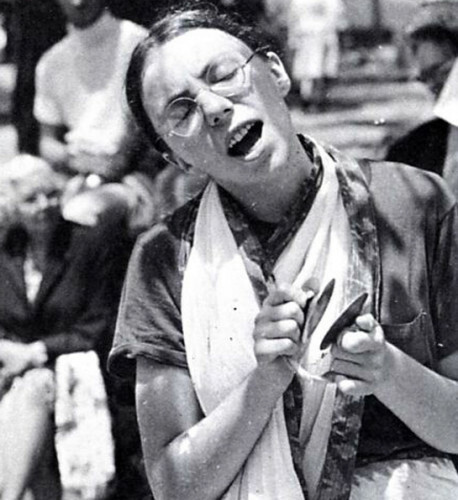 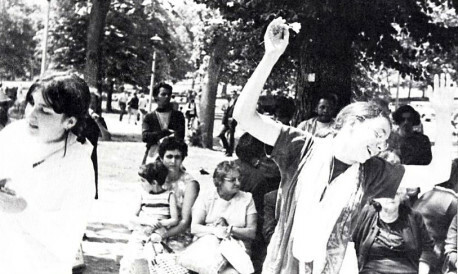 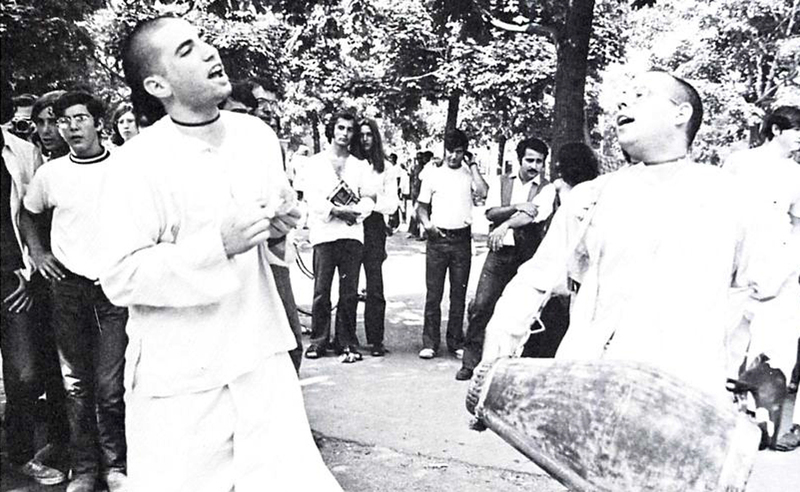 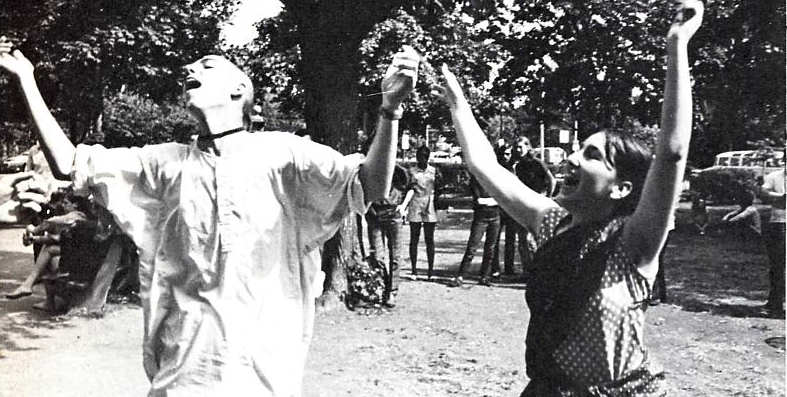 The devotees chant throughout the day in the parks and streets of Boston. 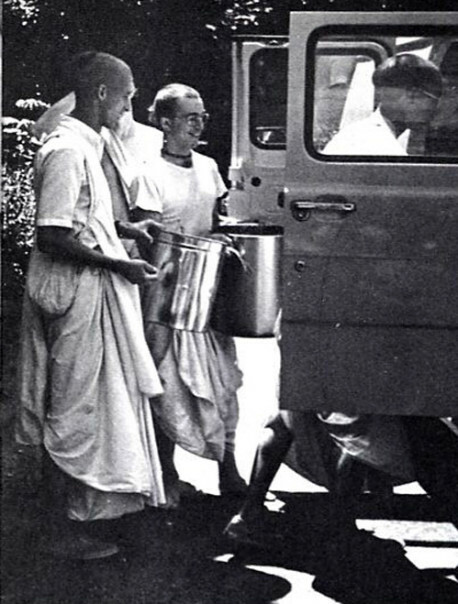 In this age, sankirtana is especially recommended as the highest welfare work. 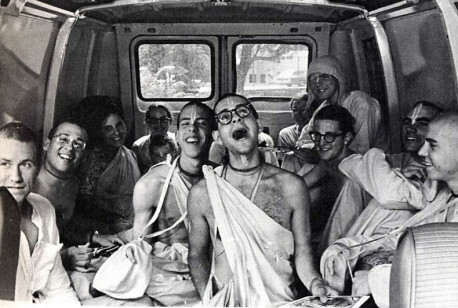 The distribution of Krsna consciousness to the living entities who have forgotten Krsna is a far greater service than the patchwork of material welfare work, altruism, etc. 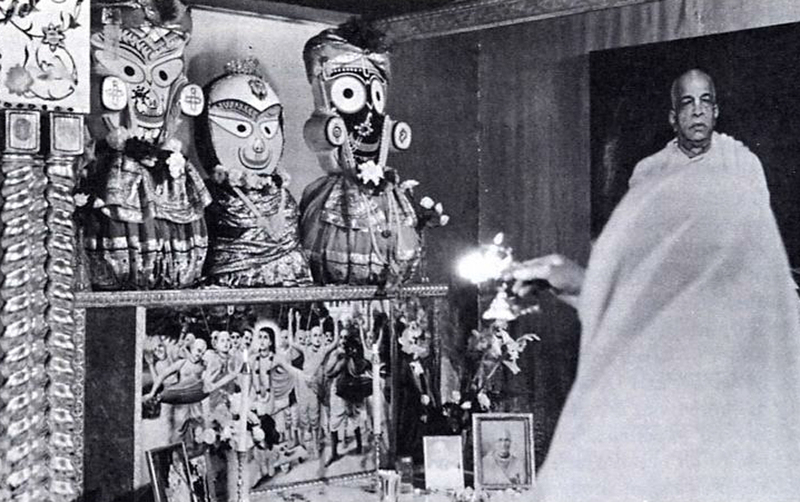 The offering to the Deity in the temple is at 11:30. 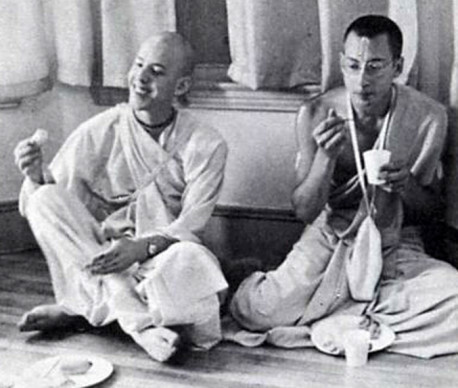 Food is prepared with the consciousness that it is not primarily for the devotees but is for Krsna in His Deity incarnation. 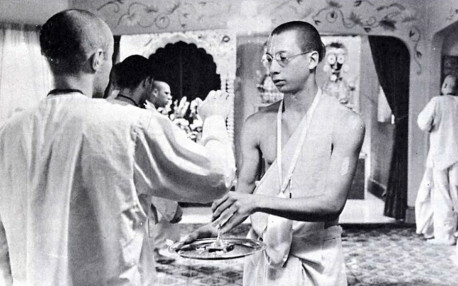 Prayers to the spiritual master are sung before the Deity, and then the offered food is to be taken as prasadam, or divine remnants first accepted by God Himself. 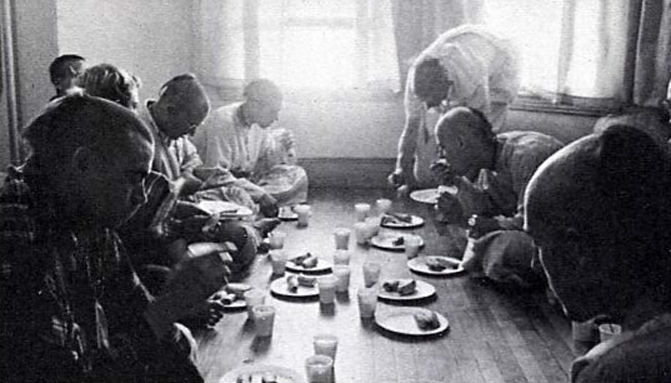 All food taken at the temple is first offered in this way. So every activity, even eating, is calculated to increase spiritual strength. One simply has to apply his body and mind to Krsna’s service, and he will thus become cleansed of material desires to satisfy himself and will instead try to please the Supreme directly. The ISKCON press is on a special schedule. All phases of transcendental printing go on at the Boston center, beginning from receipt from the spiritual master of dictaphone tapes for a book such as The Nectar of Devotion. The tapes are typed out, edited by English and Sanskrit editors, composed and made ready for print, then printed, bound, and distributed to Krsna consciousness centers all over the world. 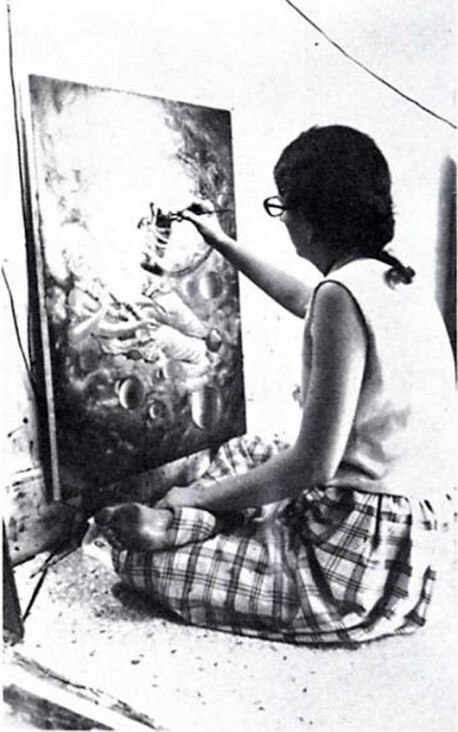 Illustrations for these books are done by a team of artists working under the direct order of His Divine Grace. 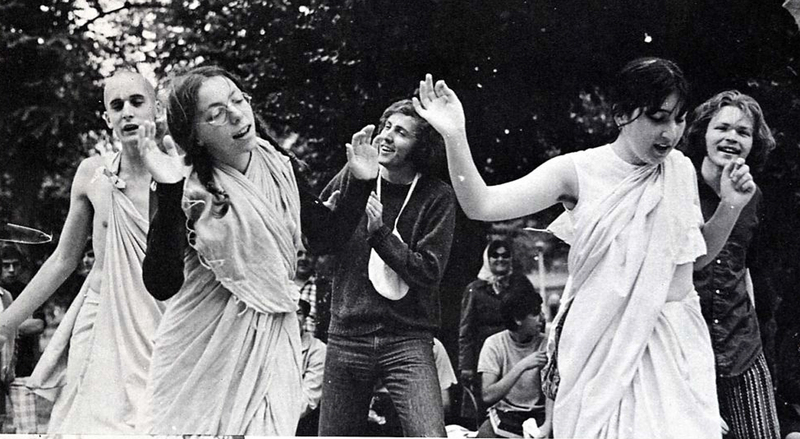 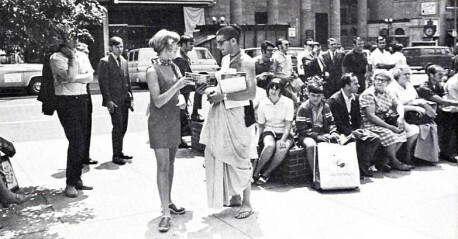 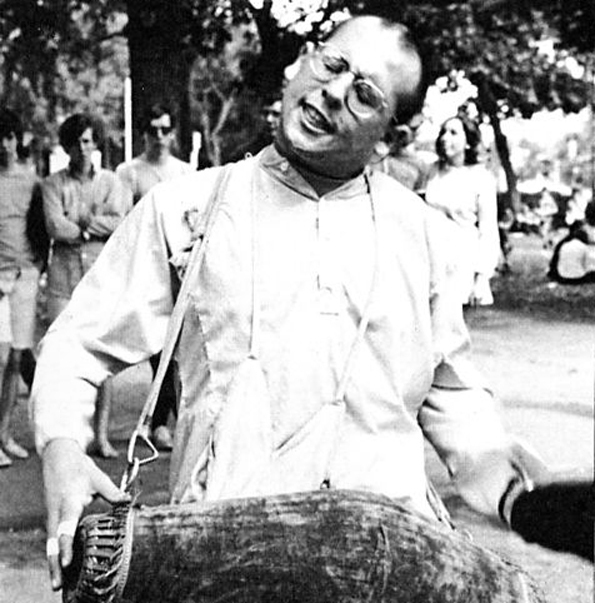 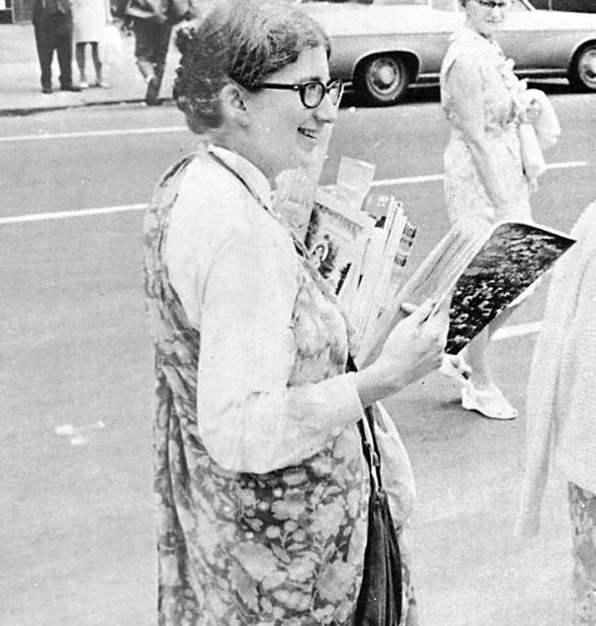 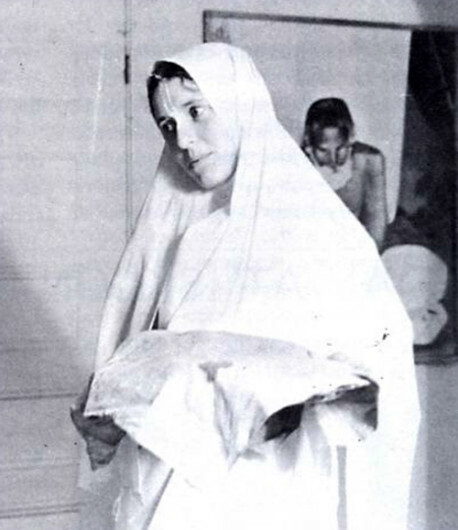 Prabhupada has called the press his heart. 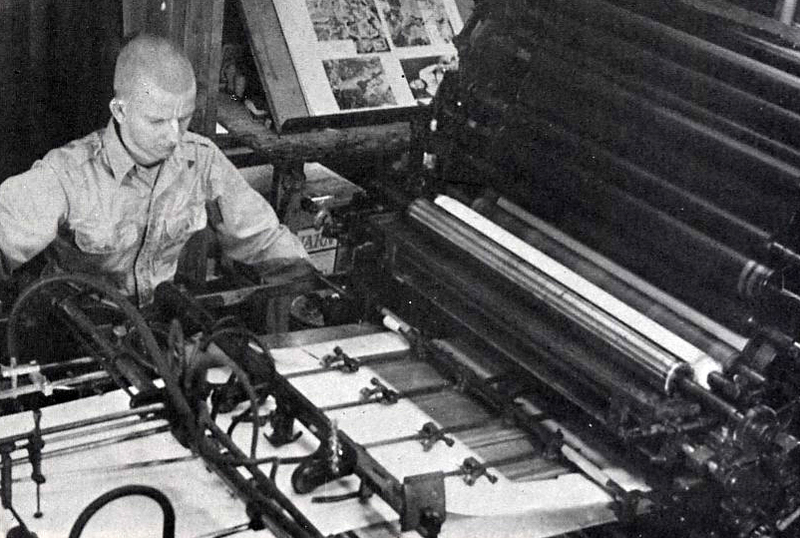 Press workers follow the temple schedule as closely as possible while putting in long hours of work on this special mission of the spiritual master. 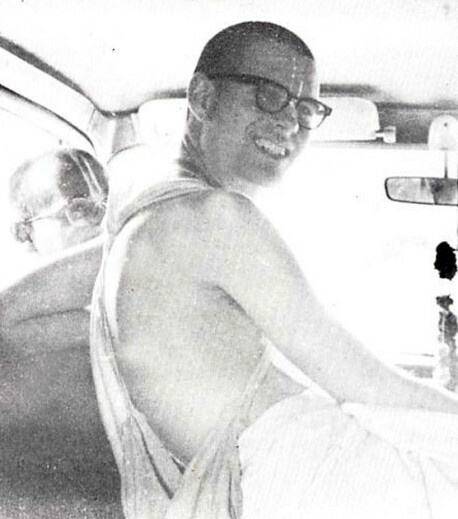 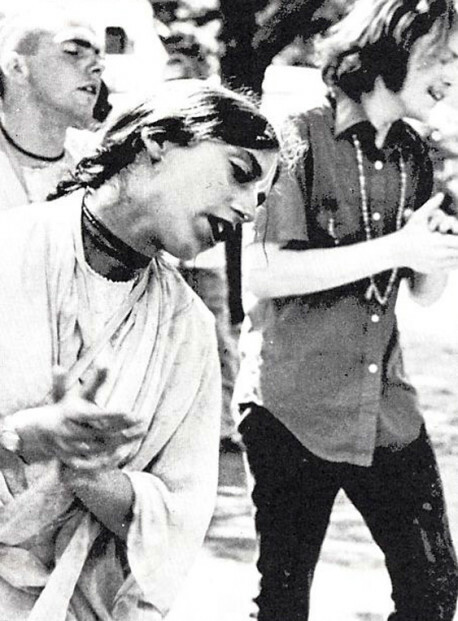 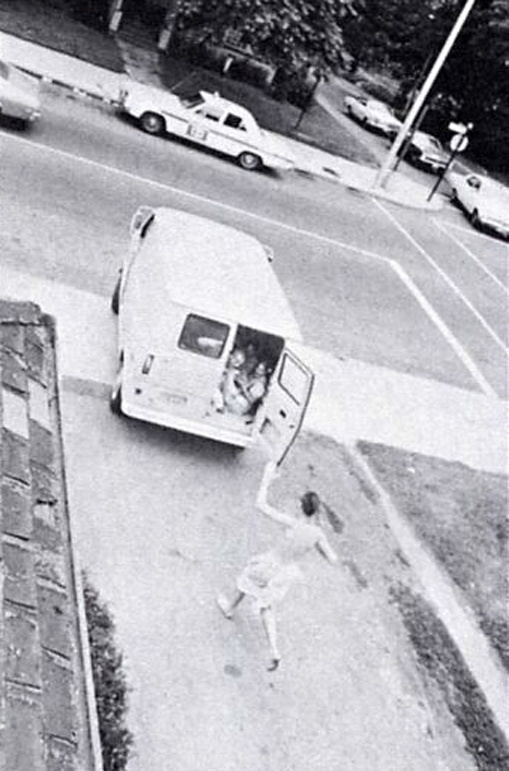 At noon the sankirtana truck takes out several more devotees, who join the sankirtana party which has already left at 11:00. 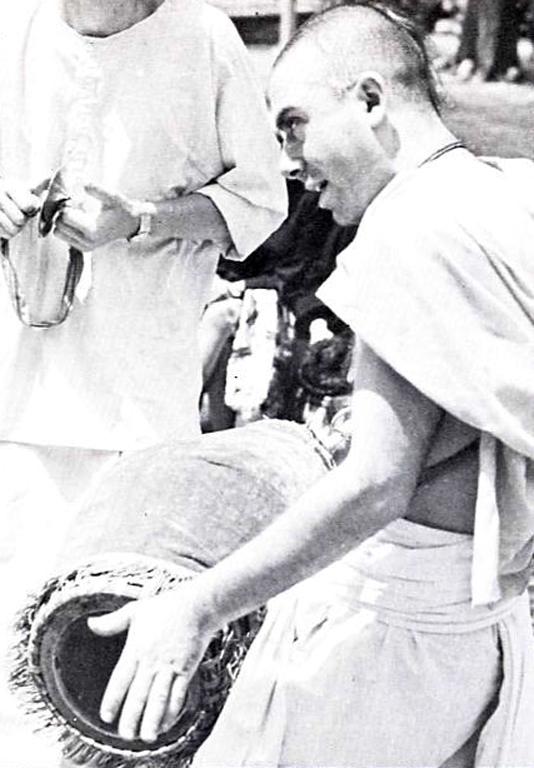 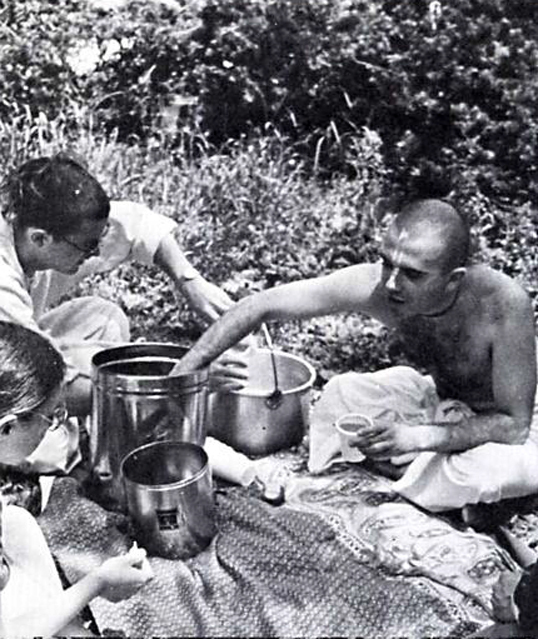 Prasadam is brought to them in the field, where, according to Sri Krsna, they are doing the highest work. 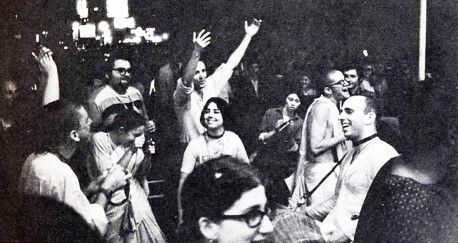 After the Devotees take prasadam, the ecstatic chanting party continues, and chanting and distribution of literature go on until 6:00. 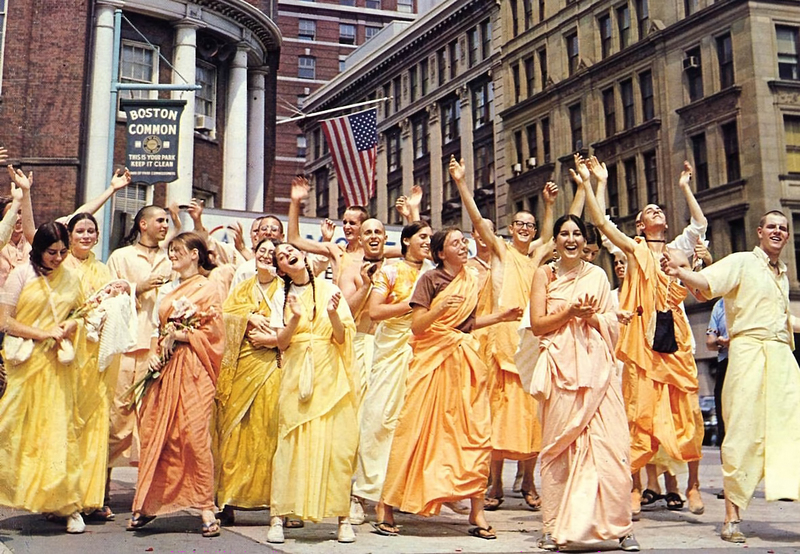 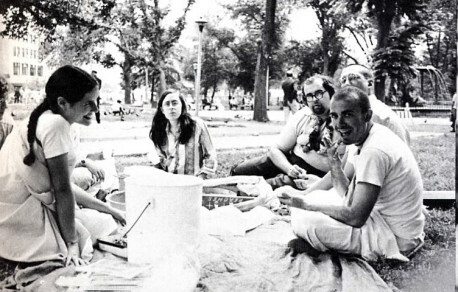 Every evening at 6:30, all the Boston devotees, numbering about forty, join for evening prasadam, along with as many as twenty guests, most of whom are attracted during the day by the sankirtana chanting in the streets. After taking plenty of delicious prasadam, all are invited to attend the ecstatic 7 P.M. aratrika worship in the temple. 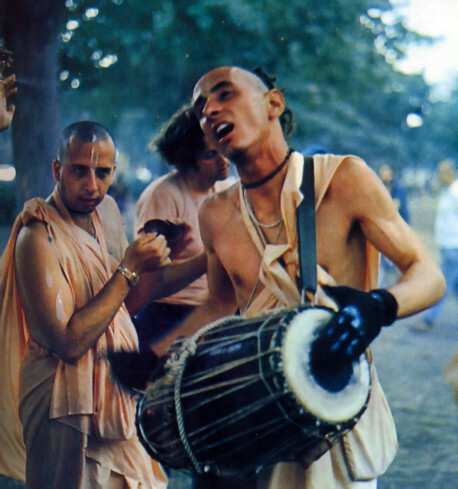 There, before the Deities of Radha and Krsna and Lord Jagannatha (spiritual forms of Krsna and His expansions), the devotees ecstatically sing the holy names and dance, accompanied by mrdanga drums, karatalas and harmonium. 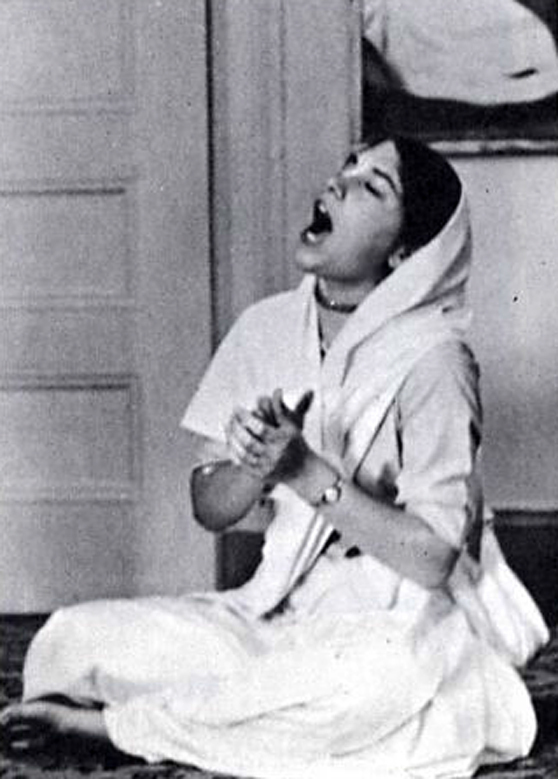 This transcendental chanting, performed with sincerity, cleanses the heart of all material anxiety and brings complete relief to any person who takes part. 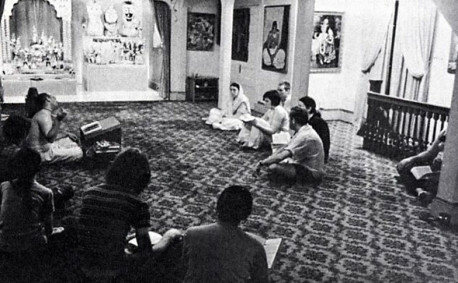 Following aratrika a forty-minute Bhagavad-gita class is held, following which guests and devotees ask questions which are answered on the authority of the spiritual master and the Vedic scriptures. 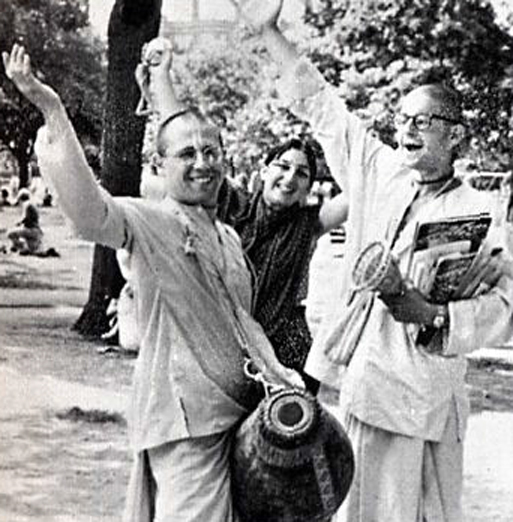 Hearing of the topics of the Supreme Personality of Godhead is very important in the process of bhakti; simply by hearing from the proper Vedic authority, one can advance toward attachment to Krsna. 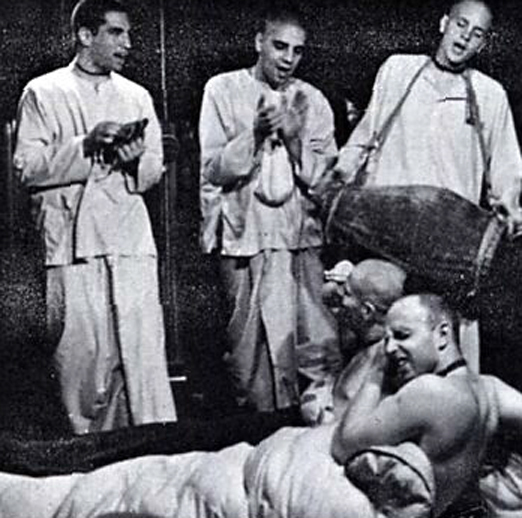 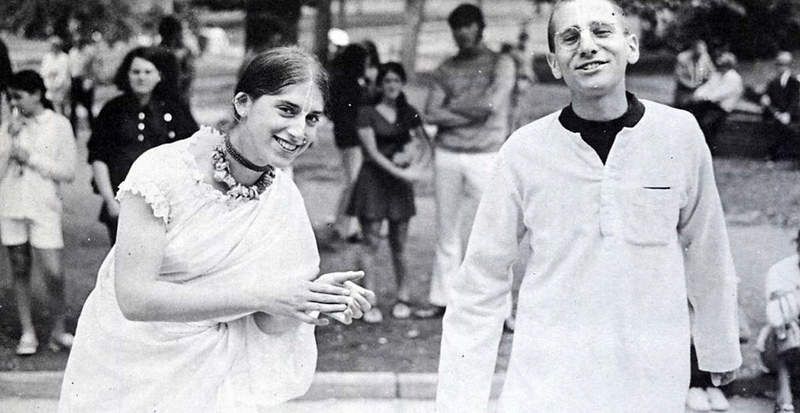 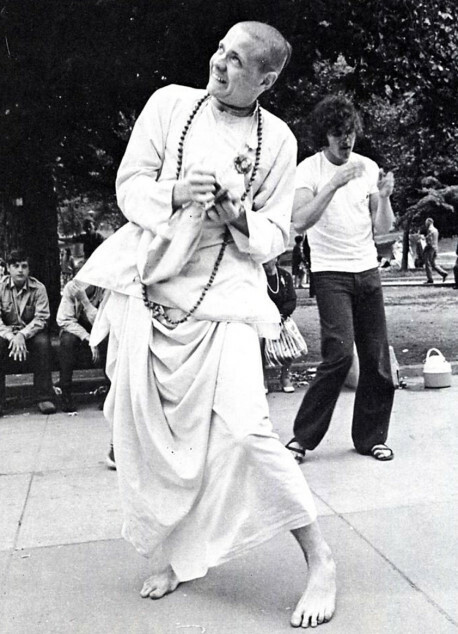 All these activities are authorized by the founder-acarya of ISKCON, His Divine Grace A.C. Bhaktivedanta Swami Prabhupada, who is a pure devotee of the Supreme Lord and who is himself authorized by a chain of spiritual masters in a disciplic succession going back to the time of the creation of the universe. 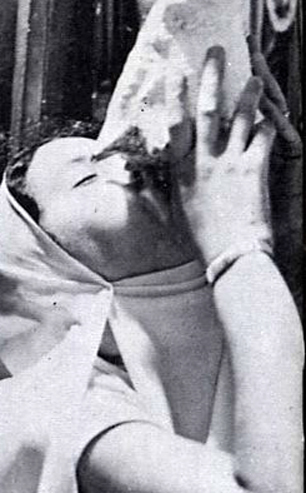 Lord Caitanya, the avatara who 500 years ago preached exclusive engagement in chanting Hare Krsna for all peoples, prayed as follows: “One can chant the holy name of the Lord in a humble state of mind, thinking himself lower than the straw in the street, more tolerant than the tree, devoid of all sense of false prestige, and ready to offer all respects to others. In such a state of mind one can chant the holy name of the Lord constantly.” Thus the chanters do not hesitate to chant anywhere and everywhere for the benefit of all. 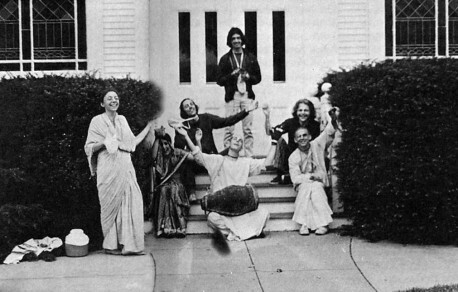 One can understand that the boys and girls who engage six hours daily in this sankirtana activity are automatically freed from the immoral practices of this age and are situated in the ocean of transcendental bliss. 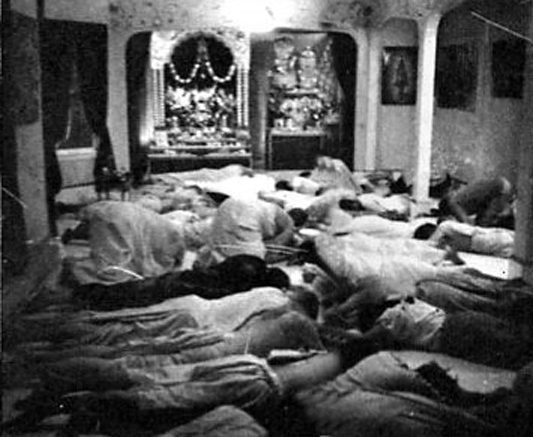 All devotees take rest by 10:00 P.M. It is stated in the Vedic scriptures that the passing of a day means that one day has been taken from our life’s duration, and all the money in the world cannot buy back that time. Time takes away our life day by day until finally there is nothing left but death. That is the predicament for all who spend their time in bodily, material consciousness, forgetful of their eternal relationship with God. But the time of those devotees who constantly engage in transcendental loving service can never be taken away, nor at death can such devotees be forced to give up their God consciousness. 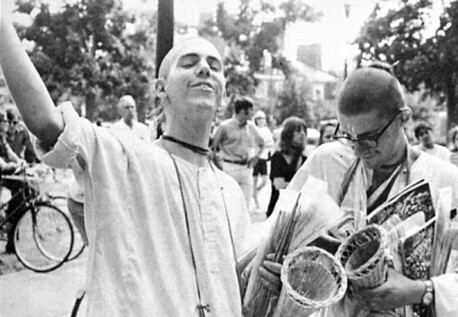 A day at ISKCON in the eternal devotional service of the Lord’s pure devotee is counted permanently as an asset toward the ultimate goal of attaining the kingdom of God.